We are your source for bodybuilding, fitness, health, motivation, nutrition, diet & fat loss information. "the most articulate and well-read spokesman in America for an all-round fitness lifestyle." Author of ten books and 3 DVDs, he believes in combining weights, aerobics, and sound nutrition to achieve lifetime fitness and leanness. Our latest book - Number 10! Help yourself live longer, stronger, and healthier! Just been looking through your website while having my coffee on my night shift here in the UK. 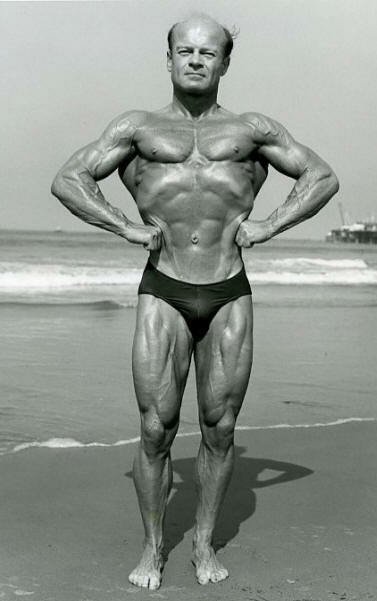 It's a little after 0240hrs and I've been reading some articles on Vince Gironda and looking through yours and Frank Zane's old photos from back in the day! I've gotta say bodybuilding and physique has really lost its way over the years. The Anabolics have completely ruined the physique. Your conditioning was insane Clarence! I mean you really came into your top form in your 40's. You gotta love the fact you've held your condition all these years. Phenomenal physique and really inspiring. I think a lean athletic physique is the way to go for sure! I'm 38 and seeing the levels of conditioning you achieved after the age of 40 is something to behold. Thanks for the inspiration, and thanks for the great content on your site also! I just want to drop you a short note of thanks. I'm a recently retired 70 year old pharmacist. I first started reading your work way back in my old drugstore days when I could steal a few minutes and goof off. Thanks to you I'm still working out with high intensity and strength training a few times a week as you recommend. And I have read all of your books. I cannot tell you how valuable your writing have been to me during my career as a working pharmacist. I knew I could always count on your recommendations as being well researched and up to date. I hope I (we) have helped some patients along the way. So I just wanted to thank you and wish you continued Health and a long life. I am sure there are many more people just like me that feel the same way that I do. Clarence: At 59, I have spent my life making things simple. 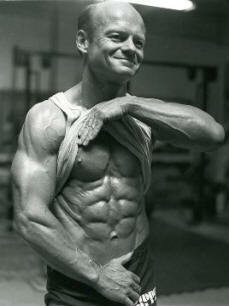 I have maintained a 5'10" 160 lb physique for 40 years. I take no medicine, supplements or vitamins and have a simple diet of fruit, vegetables, oats, rice, peanut butter, yogurt and chicken. My workouts are just under 40 minutes 5 days a week and I use a minimal of equipment along with bodyweight exercises (sit-ups, ab wheel roll outs, pull ups, push ups and dips). I have good muscularity and flexibility along with a resting pulse of 50 and average BP of 120/65. 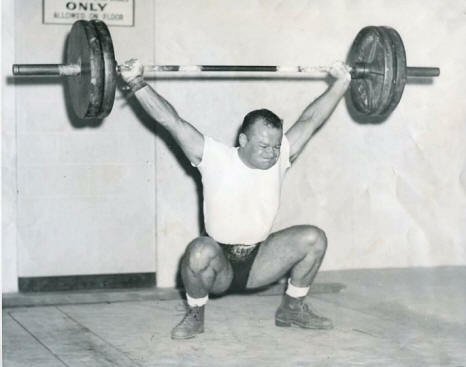 I have been inspired by Jack LaLanne and Clarence Bass. My success in marriage, family and business is in many ways attributable to my fitness and I can credit my fitness to my Spartan home gym and simple exercise regime. 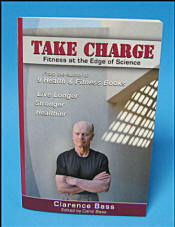 Thanks for being an inspiration and like Jack Lalanne before you a national treasure. Good afternoon. Nice to meet you via e-mail. I have followed your career in bodybuilding and bought one of your books, Challenge Yourself. The book was very well written and informative. You truly provide superb scientific information and wonderful practical knowledge to us the readers and followers. At 58 and heading toward the "golden years," it is very reassuring to have all the information you provide. It is also inspiring to see that with hard work and sensible eating patterns you can be healthy and strong later in life. I am incorporating many of the principles you discuss, such as walking. I have two medium sized dogs and except for lightning, I walk them every day for two to three miles, do one intense cardiovascular sessions a week and two full body sessions of weightlifting a week, with one being traditional lifting and the other being more circuit training. I am very grateful for all your advice on training, nutrition and a healthy lifestyle. I hope our paths cross one day so I can personally thank you for your excellent work. Thanks for sharing the article on how exercise slows down muscle aging and strengthens the immune system. I've just turned 55 and having read this has motivated me more than ever to exercise hard and eat well. I really look forward to reading the informative articles you put up on your website each month and I particularly like your take on each article. You will always be my go to man for health and fitness. Keep up the awesome work! I just want to say thank you for the fabulous information and site you have put together. I saw you in the magazines I read as a kid. I've just turned 30, strong but fat after getting married, having kids, getting lazy, etc. You have motivated me to be my best self again and reduce my weight. I always wanted abs like yours and seeing what you have accomplished way down the line I have no excuses in my 30s. You are a true representative of physical culture, longevity and wisdom. A far cry from the chemical Frankenstein bodies of today's bodybuilding. You show balance, health and provide a positive role model to may young and old. Thank you. Excellent Health marker tests Clarence, most people bury their heads and would rather not know at any age. This attitude also allows one to continue along a destructive health/lifestyle regime as in "if I am not aware of any problems I do not have to solve them." Regarding the testosterone reading of 788 at 80 years of age without TRT - Incredible. During the early 80s I used to see your advertisements and articles in Muscle & Fitness and bypass them for more heavily built stars of the day (Arnold and Sergio) but having gotten older (51) I realize how much wisdom your methods hold and can aid a person to attain good health and well-being for life. Thank you very much for the very fast delivery of your book Lean for Life. And it was autographed to boot!! Also, many thanks for the bonus book The Lean Advantage 3. That was unexpected and much appreciated. But I have a confession to make. I have known about Clarence Bass for many years. I am a lifelong fitness exerciser using just barbells and a stationary bicycles at home (69 years old, 6’4”, 190). I have been VERY impressed by Clarence in the muscle magazines over the years, but unfortunately never went to your website. Well, several weeks ago I was linked to your website through another article I was reading on the internet. Boy, was I SHOCKED!! I actually think I lost consciousness for several minutes. It was just too much for my aging, feeble brain to absorb all at once. I immediately went to my Amazon Prime account and ordered brand new copies of “Take Charge, Great Expectations, Challenge Yourself and Ripped 1” (I have the receipts to prove it!!). I noticed your website ordering section, but of course I thought “it will take weeks for the books to arrive.” Now I know better. And to think I could have probably had those books autographed really hurts!! (I generally “jump around” a book looking for relevant sections of most interest to me - I eventually read the entire book). I have also been on your website every single day since I discovered it. Clarence looks “beyond comprehension.” He looks better at 80 than anyone else at 20. I feel like crying when I look at his pictures. It hurts that bad!! By the way, you should not let Clarence bask in all the glory. You look VERY HOT!! yourself. I know there are millions of men all over the world just waiting for your bikini photos to appear on this website, YOUNG LADY!!!! Recently I was giving a public lecture on the beneficial health effects of high intensity training. When addressing the "anti-aging effect" I showed the audience the pictures of you from your homepage (that show you at 30, 40 etc.). The people simply could not believe their eyes. Even when I continued talking about the next aspect of my lecture, someone asked me to switch back to the slide with your photos and asked if such a condition was really possible. How is that for a compliment! [Your expanded training pictorial] is a dramatic example of what exercise and nutrition and healthy living can accomplish over a life span. Thank you for including me. I look forward to sharing this with my students. The quote from [Dr. Spirduso] is well deserved... She is the recognized world renowned expert. Besides your physical accomplishments, you are the only one I know who has not seen their career diminish in their late 60's and 70's. Your latest book shows you are at an even higher level than before. ** Processed or Unprocessed - How do you tell? **FAQ 13: Lifestyle Factors Influencing Testosterone? **FAQ 11: Single- or Multi-Joint Exercises? ** Can You Be Too Fit? **FAQ 11: The Black Hole of Exercise? **FAQ: What's New in Physical Activity Guidelines? **FAQ 13: Flexibility: Stretching vs. Strength Training? Anyone with medical problems--of any nature--should see a doctor before starting a diet and exercise program. Furthermore, even if you have no known health problems, it is advisable to consult your doctor before making major changes in your lifestyle. Invariably, if you are out of shape and want to start training, follow the advice of the American Medical Association: "Start slowly and increase the vigor and duration of the activity as your fitness improves." P.O. Box 51236, Albuquerque, New Mexico 87181-1236 U.S.A.
General Information: cncbass@aol.com (e-mail) (Please do not send attachments or photos. Company policy prohibits the downloading of attachments or photos). is the trademark of Clarence and Carol Bass. Copyright ©1996-2018 Clarence & Carol Bass. All rights reserved.